Rio Tinto and its joint venture partners, Mitsui & Co, Nippon Steel & Sumitomo Metal, will spend about $1.55 billion to maintain production capacity at two iron ore projects in Western Australia. Rio will invest a total of $820 million to develop the projects at the Robe River Joint Venture in Australia’s mineral rich Pilbara region, the Anglo-Australian miner said in a statement on Monday. Rio said the investments would enable it to sustain production of its Pilbara Blend brand of iron ore and its Robe Valley lump and fines products. The move follows similar announcements by rivals BHP Billiton and Fortescue Metals. “It’s really about production replacement,” said Rohan Walsh, investment manager at Melbourne based Karara Capital. “It’s generally expected that all the major Australian iron miners face the need to invest in projects to sustain current production rates from 2020 onwards,” he said. 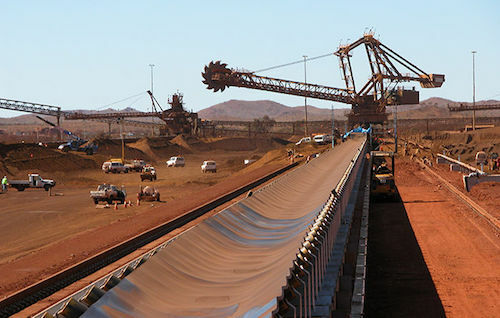 In June, BHP gave the go-ahead for a $2.9 billion spend on its huge South Flank iron ore expansion, while Fortescue said in May it would spend $1.28 billion to build up its higher grade Eliwana project also in the Pilbara. Australian miners and Brazil’s Vale SA have been shipping record amounts of ore to China as it seeks higher grades to offset stricter environmental regulations. Investors are still waiting for Rio Tinto’s decision as to whether it will approve development of its Koodaideri site in the Pilbara, which would mark a key expansion in its production volumes. Rio said the two new projects will be serviced by 34 existing haul trucks that are retrofitted with autonomous technology. Subject to approvals, construction of both projects was expected to start next year. The project funding has been included in Rio’s replacement capital guidance of around $2.7 billion from 2018 to 2020. The move comes as Rio has been selling off its coal assets, with a view to focusing on its core commodities, such as iron ore. The work is expected to create about 1,200 jobs, the miner said. Rio Tinto owns 53 percent of the Robe River Joint Venture.